I have been a little obsessed lately with the Rowan Kidsilk Eclipse yarn I bought up in a pale, shimmery gold shade called Virgo. It knits up into a barely there, transparent fabric that is fluid and molten. For months, I have spent most of my weekends and evenings studying for the MBA. This leaves little time for knitting and other relaxing things. Last weekend, I downloaded an audiobook I had been waiting impatiently for, and spent a day in utter, decadent luxury – sitting in bed, listening to my book and knitting away. I am knitting a sweater in piece work; knitting bottom-up, flat. I realize that most of my sweaters the last few years have been knit in-the-round, which means I try them on frequently and know that they fit. Last weekend, my book was great, I was in the zone, and I kept knitting up the back piece of the sweater, merrily making waist decreases till I hit the waist, and then increases up to the armhole. I am not really following a pattern and was mostly operating on auto-pilot. At some point, I took a small break, stretched the piece out to admire it, and realized that it looked small. Really small. Not going to fit me small. I spent at least an hour taking measurements – measurements of me, of the piece, of nearly every sweater that I owned – then I tried on nearly every sweater that I owned, re-measured everything, and concluded that, sadly, I needed to rip. I had cast on enough stitches, but had added too many paired decreases, at too sharp a slope. I needed to rip out 11″ of knitting. Well, it goes without saying that ripping is sad. It is frustrating. It is discouraging. Anyone who has ever ripped out mohair will know – it is also a royal pain. Ripping out lace-weight mohair that is plied with a metallic thread – not nice. I ripped and ripped, sighed a bit, put the stitches back on the needles, put my headphones back on, and began once again to knit. I knit six inches, and had finished my third pair of decreases when I stopped for a minute to count my stitches. 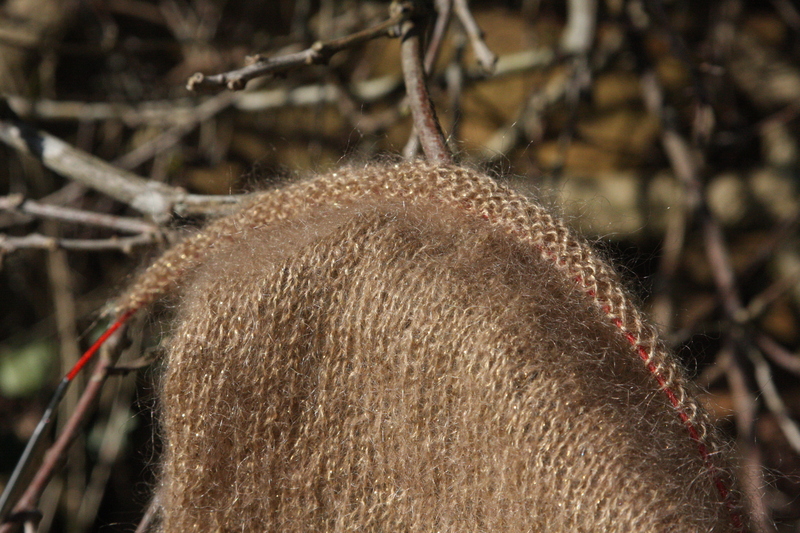 It is easy to lose a stitch with laceweight mohair – its always best to count occasionally. I found, however, that I had too many stitches. Twelve too many stitches; how could this be? Smart readers may have already figured it out – I made three sets of paired increases instead of decreases! Aarrgghh! I had to rip out another six inches! I don’t know whether it was the book, which I could NOT stop listening to, or the yarn, which was hypnotizing me. Probably both. But the result was hours of wasted knitting, copious amounts of ripping, and the killer – a flare-up of my repetitive stress problems. (I have deQuervaine’s tenosynovitis; which I blogged about here.) I had to forego knitting for the next five days to try to settle it down, and will have to take it easy for a while to keep it under control. The moral of the story: Do not be seduced by great yarn and a great book; Know when to put your knitting down! This entry was posted in Main and tagged Knitting, Rowan Kidsilk Eclipse by knitigatingcircumstances. Bookmark the permalink. OK, I have to know, what in the world was the book that distracted you so? It must be really really good. I would love to say that I am working my way through the Man Booker Prize Shortlists for the last decade, so that I could sound intellectual. I was listening to Vision in SIlver by Anne Bishop, the third novel in her Others Series. I have listened to all three, read by Alexandra Harris, and really enjoyed them. I, too, suffered from deQuervaine’s and had the surgery in 2010. Didn’t help. What did the trick for me was learning to knit in an entirely different way. 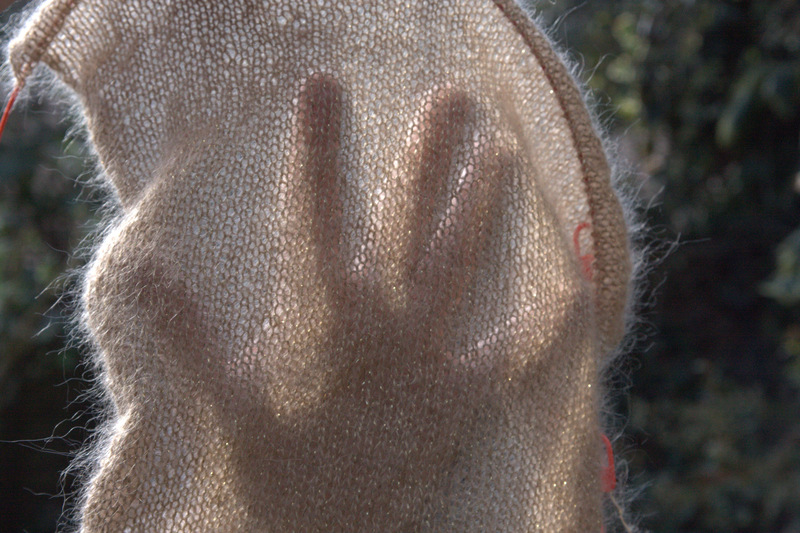 I was an English thrower, pinching the yarn between my thumb and forefinger and twisting my wrist. Now? I am a continental picker, having watched videos of Irish Cottage Knitting on Youtube. Changed my knitting life, and I now knit pain free for as long as I want. I wish you all the best. Your knitting is beautiful and your blog so very interesting and compelling. Thank you! Hi Susan. I am also an English thrower. I have learned how to do two-handed knitting, where I do a combination of throwing and picking, but the Continental knitting still feels slow and awkward. My deQuervaine’s is in my left wrist, however; I think that the left wrist twists even more in Continental knitting than English knitting. In any case, I hope to practice more over the summer when I have some free time. Thanks for the advice. Oh, no! So sorry to hear you have aggravated your condition… how discouraging. You know we have all made these same mistakes at some point. We feel your pain. I personally find I make more errors when doing plain knitting than when I’m doing a complicated pattern! I think you are right about it becoming hypnotic. I think you are right about plain knitting; it’s easy to stop paying attention. I know better than to knit for so many hours at a time; this is a reminder from my hands to be good to them. Seconding the book title request! Your post hurts on so many levels. I empathize and hope things are back on track again. “Your post hurts on so many levels” – that makes me smile! Maybe this will prod me to stop procrastinating and write my paper on Strategic Marketing! So sorry to hear about repetitive stress recurring. Having suffered from tennis elbow over a decade ago and working to manage my knitting blitzes, I feel your pain! Hi Karen. I think I managed to catch it in time so that its only a small setback. Thanks for the message. Enjoy those knitting blitzes! Beautiful yarn! Hope your hands heal. It’s miserable to want to knit and not be able to. Hope you’re back to pain-free knitting soon. Your work is always so beautiful.